Modified 800a with extended drive belts and 3-foot T-table to reduce operator packing time and effort and increase productivity. 3M AccuGlide II Taping Heads apply 36 mm to 48 mm wide tape top and bottom. Up to 30 cases per minute. 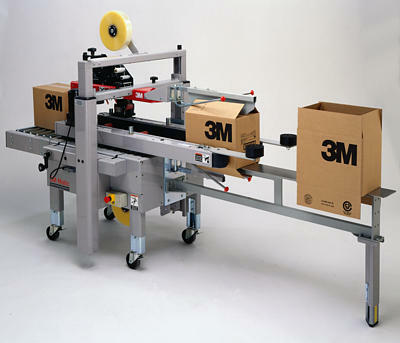 Choice of case sealers for gapped flap corrugated cases. Models available for applying two strips for Scotch� Box Sealing Tape, or one strip of tape up to 144 mm wide.